A responsive, eCommerce web solution for an outdoor adventure experience provider, operating predominantly in Yorkshire and the Lakes. 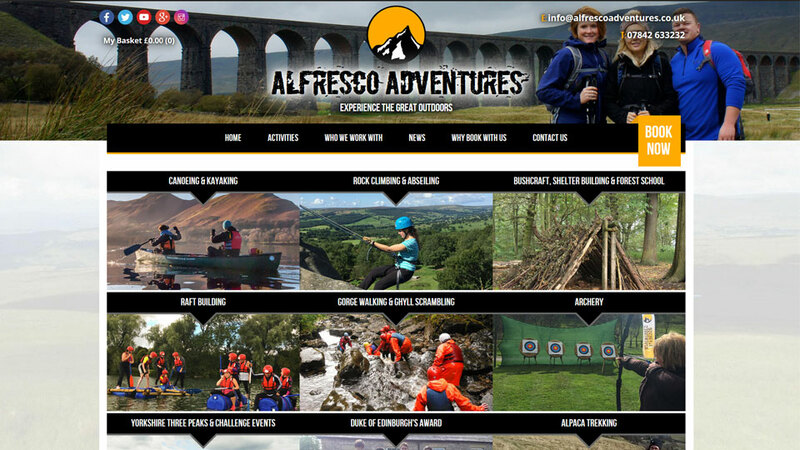 Alfresco Adventures Limited are a Yorkshire based provider of outdoor adventure experiences. We previously looked after hosting of both their mailboxes and pre-existing website and were engaged to redevelop their website in late 2016. As the business expanded to run activities across a wider area, a new website was required; a site that reflected both the vibrant personality of the company, and the new location in which activity sessions were now offered. Online booking was established as a key priority, and the former sites lack of suitability for display on smaller devices was identified as a main concern. The final website design we came up with was created to give a bold and vibrant feel, in-line with the brands exciting and positive values. After consultation with the client, we decided that WordPress provided the most suitable CMS to suit their budget. Using a pair of pre-built shop and booking calendar plugins, we created an easily updatable site that allows fast management of both online and offline event bookings. The finalised design was then developed into a custom, mobile-first responsive theme. The WordPress install was kept deliberately lightweight, with as few plugins as possible. We made use of PHP and JQuery to code custom functions to integrate as many features as possible into the theme itself. We worked alongside the client as they carried out a complete overhaul of their existing content, working to improve both the activity photography they displayed, and updating the written words to reflect their new online booking system, and expanded adventure offerings.